The above quotation, written in the 19th century by American author John Neal, might as well be the motto of the Oxford University Press’ Very Short Introduction range of titles. There are currently 193 in the series, covering subjects from the merits of Egyptian Art to an analysis of Game Theory, and seemingly everything in between. This latest title has been written by renowned palaeontologist Michael J. Benton, and it begins its 170-page journey right at the start, with the newly-cooled Earth. These first thirty or forty pages will be the most familiar to anyone already working in the field of astrobiology, with discussions on the search for biomarkers and the RNA world hypothesis among many areas covered. As such, this section of the book provides a fine primer to anyone who is interested in astrobiology, but perhaps does not possess much of a background to cover the -biology part. That is not to say that the rest of the book is not worth reading, however, as nothing could be further from the truth. The narrative helps to place all those pre-biotic chemicals and Miller-Urey experiments into a wider context. The story of life wings its inexorable way through several billion years more, finishing up with the arrival of H. Sapiens several hundred thousand years ago. 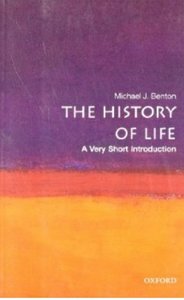 As with the rest of the series, The History of Life: A Very Short Introduction is a book which you could quite easily finish in a single sitting. There is that sense of there being a library of knowledge hidden just underneath each sentence, but due to the author’s lightness of tone and humour there is never the feeling of being overwhelmed with information. This book does exactly what it should do: makes you want to find out more.